Utah Senate candidate Mitt Romney said he is more conservative on immigration than President Donald Trump. Romney opposed a pathway to citizenship for DACA-eligible immigrants, breaking with the White House proposal from earlier this year. 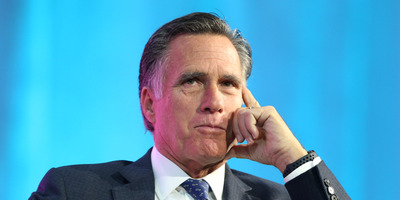 Utah Senate candidate and former Republican presidential nominee Mitt Romney said he is farther to the right on immigration policy than President Donald Trump. In a question-and-answer session in Provo, Utah, Romney touted his conservative credentials and bucked many Republicans who want a permanent solution to immigrants benefitting from the Deferred Action for Childhood Arrivals program, according to local media. The White House proposed granting a pathway to citizenship for the nearly 1.8 million undocumented immigrants who are eligible for the DACA program. Romney pushed back on that proposal, suggesting no immigrant should be allowed to stay in the United States if they came unlawfully, regardless of circumstance. A permanent solution for DACA recipients is currently in limbo as lawmakers failed to reach a deal earlier this year, despite Trump’s hard deadline of March 5 for the program to end. After a court ruling alleviated concerns that DACA would disappear altogether after the deadline, Congress has yet to get the ball rolling again. In the Senate, only Texas Republican Ted Cruz held that DACA recipients should not receive a pathway to citizenship. If Romney wins the upcoming race in Utah to replace retiring Sen. Orrin Hatch, that could add to the list.